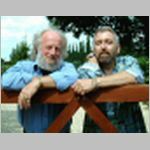 You have asked for them and we got them, Lincolnshire’s very own Bill Whaley and Dave Fletcher are coming to play and sing so be ready to join in the choruses and applaud. You’d better be good because they’re brilliant. Great songs and wonderful accompaniment all delivered with wit and style. Be warned an early arrival for a seat is advisable.